A workplace bulletin for Tube workers, by Tube workers, discussing the fight against racism following the Woolwich murder, the "Justice for the 33" campaign, and your local and workplace stories. An industrial bulletin for Tube workers, by Tube workers, featuring stories on the Tories' plan to ban strikes and the "Justice for the 33" campaign to win reinstatement for sacked agency workers. Plus your local and workplace stories. An industrial bulletin for tube workers, by tube workers, discussing benefit cuts, the victimisation of RMT activist Jay Patel, and your local and workplace stories. An industrial bulletin for Tube workers, by Tube workers, discussing the fight for jobs, Trainpeople agency workers' fight for justice, and local/workplace stories. A workplace bulletin by Tube workers, for Tube workers, discussing the Trainpeople agency workers' fight for jobs, Bakerloo drivers' detrainment action, the Athens metro workers' strike, and local and workplace stories. 150 YEARS OF WORKING THE LONDON UNDERGROUND. No. 150: WHERE WE GOT OUR GRUB. PAST & PRESENT. By "Blujah", a Tube worker and poet. Reproduced from the original post here. The Tubeworker bulletin will be organising events and activities in 2013 commemorating 150 years of workers' struggle on London Underground. A special issue of the Tubeworker bulletin on the Trainpeople agency workers' fight for jobs. Click here to download the PDF. 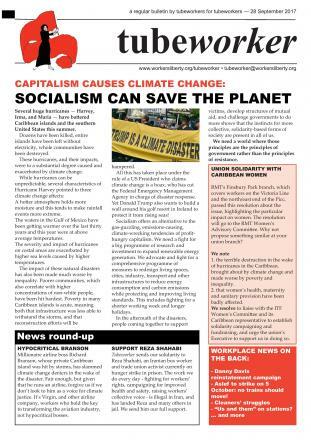 The Christmas 2012 issue of the bulletin for Tube workers, by Tube workers, discussing the cleaners' NYE/NYD strikes, Trainpeople agency workers' fight for jobs, and the ASLEF drivers' Boxing Day strike. An industrial bulletin for Tube workers, by Tube workers. This issue discusses the recent cleaners' strike, argues for a vote for John Leach in the upcoming RMT London Regional Organiser elections, as well as local and workplace stories. An industrial bulletin for Tube workers, by Tube workers. This issue discusses the fight against job cuts, the Tube Lines maintenance and engineering workers' strike for pensions and travel pass equality, and your local and workplace stories.